Scientists had feared that melt-water which trickles down through the ice could dramatically speed up the movement of glaciers as it acts as a lubricant between the ice and the ground it moves over. 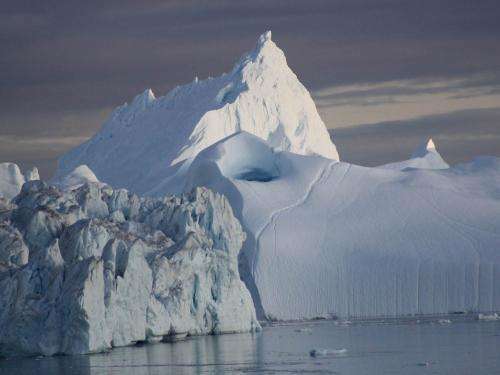 But in a paper published today in PNAS, a team led by scientists from the University of Bristol found it is likely to have a minor role in sea-level rise compared with other effects like iceberg production and surface melt. The results of computer modelling, based on fieldwork observations in Greenland, revealed that by the year 2200 lubrication would only add a maximum of 8mm to sea-level rise – less than 5 per cent of the total projected contribution from the Greenland ice sheet. In fact in some of their simulations the lubricating effect had a negative impact on sea-level rise – in other words it alone could lead to a lowering of sea-level (ignoring the other major factors). Lead author, Dr Sarah Shannon, from the University of Bristol, said: "This is an important step forward in our understanding of the factors that control sea-level rise from the Greenland Ice Sheet. Our results show that melt-water enhanced lubrication will have a minor contribution to future sea-level rise. Future mass loss will be governed by changes in surface melt-water runoff or iceberg calving." Previous studies of the effects of melt-water on the speed of ice movement had assumed the water created cavities at the bottom of ice masses. These cavities lifted the ice slightly and acted as a lubricant, speeding up flow. This theory had led scientists to think that increased melt-water would lead directly to more lubrication and a consequent speeding up of the ice flow. But the Bristol-led study took into account recent observations that indicate larger amounts of melt-water may form channels beneath the ice that drain the water away, reducing the water's lubricating effect. The scientists found that no matter whether more melt-water increases or decreases the speed of ice flow, the effect on sea level is small. Dr Shannon said: "We found that the melt-water would lead to a redistribution of the ice, but not necessarily to an increase in flow." The findings are part of research undertaken through the European funded ice2sea programme. Earlier research from the programme has shown that changes in surface melting of the ice sheet will be the major factor in sea-level rise contributions from Greenland. Professor David Vaughan, ice2sea co-ordinator based at the British Antarctic Survey in Cambridge, said: "This is important work but it's no reason for complacency. While this work shows that the process of lubrication of ice flow by surface melting is rather insignificant, our projections are still that Greenland will be a major source of future sea-level rise. As we have reported earlier this year, run-off of surface melt water directly into the ocean and increased iceberg calving are likely to dominate."